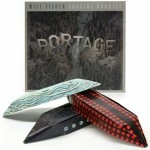 FRIENDS, COLLEAGUES, CLIENTS, ITEMS OF NOTE, ETC. . . .
WILL FISHER’S PORTAGE BOATS – FREE ORIGAMI CANOES! KYLA FRANCIS COMBINES HIGHLY GRAPHIC SCREEN PRINTING WITH REFINED ELEGANT PORCELAIN AND GLASS FORMS TO SET THE TABLE FOR A ROCK AND ROLL TEA PARTY!